Overall, I loved the Pitch Perfect 2 and would recommend it to anyone who loves music, especially A Cappella performances. The plot was interesting and the songs were terrific. The Finale was truly special and touching and added to the brilliance of the whole film. Pitch Perfect 2 is the perfect sequel to the original movie, Pitch Perfect. It is humorous, cheerful, adventurous, and creative all at the same time. Fans of the original movie won't be disappointed as the Barden Bellas compete in the A Cappella World Championships. This new version introduces the Bellas to a new rival, Das Sound Machine, a German super group that seems to be unbeatable. From the first moment they meet, there is instant tension. The Bellas need to win the World Championship in order to be reinstated, so the pressure is on. Added to that, the Bellas, especially Beca, are trying to "find" themselves and their unique sound. Anna Kendrick (Twilight) returns as Beca, the college student with a talent for beats and mash-ups. Kendrick delivers spectacular performances throughout the entire movie. Rebel Wilson (Bridesmaids) is also back as the infamous Fat Amy and, as usual, she adds so much of the humor in the film. The two actresses play off each other so well, and all of their scenes together are enjoyable to watch. New to the cast is Birgette Hjort Sorensen as the lead of Das Sound Machine and Beca's nemesis. Her timing and delivery make her every line entertaining. The Blu-ray combo pack offers a number of extras including a gag reel full of laughs, extended musical scenes, and deleted scenes, all of which add to the overall experience of watching the film. The exclusives are also well worth it, including a never before seen performance by the Treblemakers and a feature about Snoop Dogg's cameo in the movie. The 1080p High Definition video is excellent with sharp video and an array of color hues throughout the film. The audio, which is presented in DTS-HD Master Audio 5.1, is of course the most important part of a film like this and this Blu-ray doesn't disappoint. Every song can be heard across the full sound spectrum, which enhances the viewer's experience and makes the musical performances spectacular. Download Pitch Perfect 2 from the iTunes Store in Digial HD. 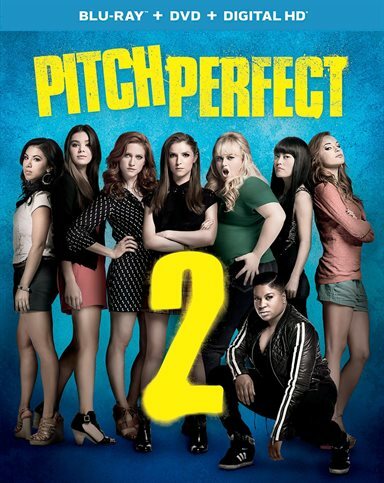 For more information about Pitch Perfect 2 visit the FlickDirect Movie Database. Victoria’s passion for film started at a young age with her family making her watch such classics as West Side Story and Back To The Future before she was barely able to speak. Miss Hanson became a child model at the age of eight and conducted her first on-air interviews with the cast of Harry Potter and the Deathly Hallows. She is currently studying communications and photography in Florida. Read more reviews and content by Victoria L Hanson.